Airtel has rolled out a new Rs. 93 prepaid recharge pack that takes on the Jio Rs. 98 pack, another retaliation in its ongoing battle with the newcomer competitor, Reliance Jio. Airtel’s Rs. 93 pack offers unlimited local, STD, and roaming calls, 100 SMSes per day (local and STD), and a total of 1GB of 3G/ 4G data with a validity of 10 days. 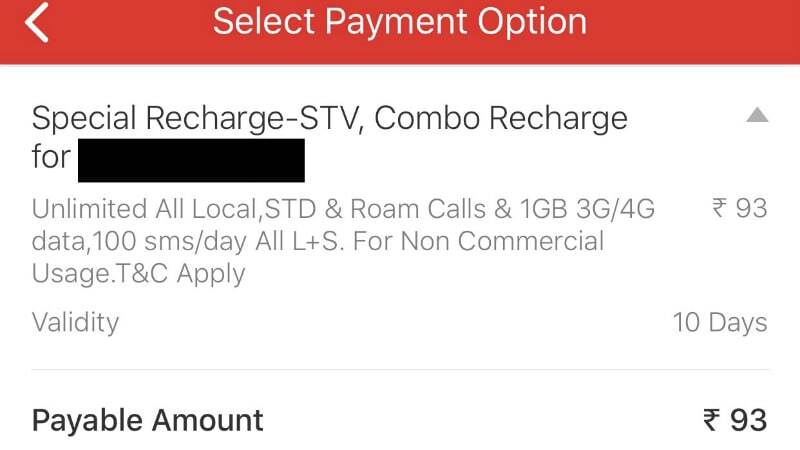 As we mentioned, the new Airtel Rs 93 prepaid pack is taking on the Jio Rs. 98 pack that offers unlimited local, STD, and roaming calls, 140 SMSes, and a total high speed 4G data of 2.1GB, with a daily limit of 0.15GB. High speed data speed is reduced to 64Kbps after daily and monthly limits get over. This pack has a validity of 14 days. Airtel had recently introduced a new prepaid pack priced at Rs. 199 that offers 1GB data per day for a period of 28 days. Unlimited calls and 100 SMSes per day are also featured in this pack. This is in direct competition to Jio’s new Happy New Year 2018 pack, which offers 1.2GB 4G data per day for the same tariff of Rs. 199 and validity of 28 days. Apart from that, Airtel also has other prepaid packs that offer similar data and call benefits. For instance, the Rs. 349 gives prepaid users access to 2GB data per day, unlimited calls (local, STD, and roaming), and 100 SMSes per day, with a validity of 28 days. Yet another pack, priced similarly at Rs. 399, offers users with 1GB data per day, unlimited calls, and 100 SMSes per day with an extended validity of 56 days. Additionally, you can check out a list of all packs offering 1GB 4G data per day as well as prepaid packs offering 2GB per day benefits to its users. These include telecom operators such as Reliance Jio, Airtel, Idea, and Vodafone.